Vibrant Fall colours adorn the banks of the Jacques Cartier River in Parc de la Jacques-Cartier in Quebec, Canada. A blend of Fall colours creates a beautiful picture along the banks of the Jacques Cartier River in Parc de la Jacques-Cartier in Quebec, Canada. 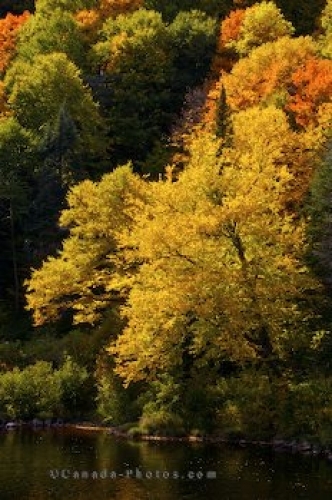 While canoeing or kayaking on the river, the entire area surrounding you is illuminated by Fall colours, but it is also picturesque to wander through the many trails throughout the park and have the trees tower above you. There is an easy 4.3 kilometer loop trail to walk near the Jacques-Cartier River which takes you across little bridges and streams. The park is filled with stunning scenery and is a paradise for nature lovers especially during the Fall. Fall colours along the banks of Riviere Jacques-Cartier, Jacques Cartier River, in Parc de la Jacques-Cartier, Quebec, Canada. Picture of the fall colours along the banks of the Jacques Cartier River in Quebec, Canada.